Home Blog Leaky Gut... Could It Destroy Your Health? Leaky Gut... Could It Destroy Your Health? Leaky Gut Syndrome (LGS) is a major cause of disease and dysfunction in modern society, accounts for at least 50% of chronic complaints, as confirmed by laboratory tests. In LGS, the epithelium on the villi of the small intestine becomes inflamed and irritated, which allows metabolic and microbial toxins of the small intestines to flood into the blood stream. This event compromises the liver, the lymphatic system, and the immune response including the endocrine system. Some of the most incurable diseases are caused by this exact mechanism, where the body attacks its own tissues. This is commonly called auto-immune disease. It is often the primary cause of the following common conditions: asthma, food allergies, chronic sinusitis, eczema, urticaria, migraine, irritable bowel, fungal disorders, fibromyalgia, and inflammatory joint disorders including rheumatoid arthritis are just a few of the diseases that can originate with leaky gut. It also contributes to PMS, uterine fibroid, and breast fibroid. Leaky Gut Syndrome is often the real basis for chronic fatigue syndrome and pediatric immune deficiencies. Leaky Gut Syndrome is reaching epidemic proportions within the population. Historically, the only way bowel toxins entered the blood stream was through trauma, for example by sword or spear. This quickly led to septicemia that might be treatable, or more probably, ended in death. Outside of trauma, the body maintained a wonderfully effective selective barrier in the small intestine, one that allowed nutrients to enter, but kept out metabolic wastes and microbial toxins rampant in the intestines. What Modern Event Allowed Such A Break-Down? Primarily it has been antibiotics, secondarily non-steroidal anti-inflammatory drugs (NSAIDs, Motrin, Aleve and Advil) with NSAIDs being the major cause of leaky gut because they so viciously inflame the intestinal lining, causing a widening of the spaces between cells and sometimes hemorrhaging. Other common causes are chemotherapy, ingested alcohol, inhaled formaldehyde from a new carpet, food allergens, stress emotions, lactase deficiency, gluten/gliaden allergy, abnormal gut flora (bacteria, parasites, yeasts). The first antibiotic, penicillin, did not enter mainstream health care until 1939. Since the 50s and 60s, antibiotic use has been frantically prescribed for every infection and inflammation, particularly pediatric ear infection, bronchitis, and sore throat. It is sadly ironic that most of these infections are viral in nature, and not only are the antibiotics damaging, but they are ultimately unnecessary. Antibiotics should be considered a hospitalization level medicine, when bacteria have entered the blood, bone, or organ. Antibiotics create their damage in two ways. The first is by destroying beneficial bacteria. The small intestine and large intestine host over five hundred different kinds of beneficial bacteria. These bacteria perform hundreds of functions required for healthy metabolism and immune response. Through enzyme secretions, bacteria transform metabolic and microbial wastes before they are discharged by the body. These wastes include cellular debris, hormones, chemical wastes, bile, pus accumulations, viral toxins, bacterial toxins, etc. For example, the body creates bile not only as a lubricant to flush wastes out of the liver, but also, to detoxify many of the poisons accumulating in the liver. Bile however is extremely damaging to large intestine epithelium. When bile enters the small intestine via the common bile duct, beneficial bacteria break the bile salts down into a less toxic compound, making it non-dangerous by the time it reaches the large intestine. When you take antibiotics you destroy these bacteria and the bile salts freely enter and damage the large intestine. I believe this contributes significantly to the high incidence of colon cancer plaguing today's society. Beneficial bacteria also break down hormone secretions that are discharged from the liver to the small intestine. If you lack the bacteria to break down estrogen and the intestinal permeability has been altered, the patient is now reabsorbing estrogens in their original state. The body will deposit these in estrogen sensitive areas such as the breast, uterus, or ovaries, contributing, if not causing, fibroids and tumors. The same scenario is responsible for premenstrual syndrome as well. Healthy mucosa allows nutrients to pass the barrier while blocking the entry of toxins. 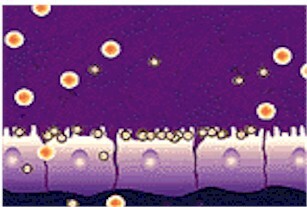 With leaky gut, the barrier is dysfunctional, blocking nutrients at the damaged villi while permitting toxins to enter the blood stream. The second way antibiotics damage the intestines is by fostering the growth of Candida albicans and other pathogenic fungi and yeast. This event, more than any other, precipitates Leaky Gut Syndrome. In a healthy situation the small intestine epithelium maintains tight cell junctions, which contributes to the physical barrier involved in intestinal absorption. In addition to the physical barrier, there is an important chemical barrier within the mucus that contains immune agents, which neutralize any toxin that comes in contact. Candida exudes an aldehyde secretion, which causes small intestine epithelial cells to shrink. This allows intestinal toxins to infiltrate through the epithelium and into the blood. The secondary barrier - immune agents in the epithelial mucus - remain the sole agent for neutralization. Eventually, the immune system becomes exhausted rising to this challenge. The damage done by Candida is to the intestinal epithelial barrier, allowing the absorption of serious toxic agents and chemicals, which then enter the blood and affect numerous organs, including the brain. When the integrity of the intestinal barrier has been compromised, intestinal toxins are not the only pathogens to be absorbed. 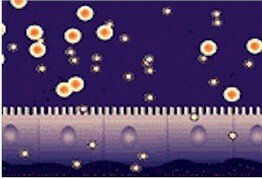 The barrier, in a healthy state, selectively allows digested nutrients to enter the small intestine when all is ready. With leaky gut, nutrients can be absorbed before they are fully digested. The body's immune response, through specific antigen-antibody markers, will tag some of these foods as foreign irritants. Every time that particular food touches the epithelia, an inflammatory immune response is mounted which further damages the epithelial lining. What started as a Candida irritation with shrinking of the cells has now been complicated with active inflammation every time a particular food is eaten. Food allergies are a common secondary problem to Candida, and if present, will maintain the leaky gut continuously, even if the Candida is eradicated. The most common food allergies are dairy, eggs, gluten grains (wheat, oats, rye), corn, beans (especially soy), and nuts. There are seldom real allergies to meat, rice, millet, vegetables, or fruit, although an allergy to garlic is not uncommon. We have to distinguish a real allergy - that which causes a histamine inflammatory reaction at the site of the small intestine (SI) epithelia - from sensitivity, which may cause uncomfortable symptoms, but seldom is damaging. Sensitivities are usually due to low stomach acid or pancreatic enzyme secretion, that is, poor digestion. In the healing of the intestinal lining, exposure to a significant allergy can sabotage the treatment. For example, one may be very good at restricting wheat, dairy and eggs, but then compromises the treatment by taking garlic tablets. The metabolic and microbial toxins that enter the bloodstream during leaky gut end up in the liver, which has the job of detoxifying and discharging the poisons. Under normal conditions, the liver is taxed just by processing the daily metabolic wastes created by cell and organ activity. Imagine the further load created by dumping serious intestinal toxins on a regular basis. There is a point when the liver becomes saturated; it cannot further detoxify the poisons, and they are returned to the blood circulation. The blood has sophisticated mechanisms for preserving chemical homeostasis, and will diffuse as much of the toxic chemicals and physical debris into the interstitial fluids as is possible. From here the lymphatic system will attempt to collect and neutralize the toxins, but unable to send the toxins to the liver, the body essentially becomes toxic. Microbes grow and develop, hence there can be chronic lymphatic swelling, especially in children. Over a period of time, toxins will be forced into distal connective tissue around muscles and joints, causing fibromyalgia, or into the cells, which can precipitate genetic mutation and ultimately cancer. The immune system is stressed in three major ways. First is at the site of the intestinal mucosa. As toxins and food antigens brush up against the mucosa, the immune system mobilizes to neutralize the toxins. Normally, much of this work would have been done by beneficial bacteria, which have been destroyed by antibiotics. For toxins that make it to the mucosa, the body will tag them with a chemical secretory IgA (SIgA), which attracts macrophages and other white blood cells to consume the toxins. It is not long before this immune response is overwhelmed and depleted. This can be measured directly with a stool or saliva test for the intestinal SIgA level. The second stressor happens in the liver and lymphatic system, which, also overwhelmed, puts demands on the immune system. The third stressor is a consequence: as the immune response diminishes, more microbes (viruses, bacteria, and fungi) multiply, allowing for a chronic state of infection. The most important organ in the production of immune agents seems to be the adrenal gland, and Leaky Gut Syndrome slowly diminishes adrenal function. In the early and middle stages, there is actually an adrenal excess, as measured by excess cortisol output. Eventually, cortisol levels drop, and one now has exhaustion. Candida flourishes when the terrain in the intestines favors it. Just killing Candida is usually not successful, because the chemistry and vitality of the terrain has not been normalized, and Candida returns. Antibiotics are the original cause of the change on the terrain. By killing acid forming bacteria (Lactobacillus bacteria produce lactic acid, for example), the environment becomes alkaline, which promotes Candida. Antibiotics and chronic illness reduce stomach acid production, contributing to the alkalinity, and also allowing poor digestive absorption. In fact, many people with LGS are malnourished and will lose excessive weight, no matter how healthy the food is that they eat. When the gut is inflamed it does not secrete digestive enzymes to digest foods properly or absorb nutrients and foods properly. The result can indigestion with gas and bloating, called irritable bowel syndrome (IBS). When large food particles are absorbed, food allergies and new symptoms are created (e.g., IBS, gallbladder disease, arthritis or fibromyalgia). When the detoxification pathways that line the gut are compromised, chemical sensitivity can arise. Furthermore, the leakage of toxins overburderns the liver so that the body is less to handle everyday chemicals in foods, water and air. Now many foods can cause symptoms that never did before, because the gut's detoxification (liver) system is unable to cope with the hundreds of chemical additives, dyes, colorings, preservatives and pesticides common in our foods. When the gut lining is inflamed, the protective coating of the gut antibodies can be lost. With loss of the secretory immunoglobulin A (SigA), the body becomes more vulnerable to infections in the intestines from bacteria, viruses, parasites and yeast and they become resistant to treatment. Ironically, the more resistant the bugs become, the more-high powered antibiotics doctor prescribe, resulting in more overgrowth of resistant fungi (Candida). As the unwanted bugs grow, the gut gets more inflamed and leaky initiating a vicious cycle of worsening condition and major cause of so many incurable diseases. When the intestinal lining is inflamed, bacteria and yeast can translocate. In other words, they can pass from the gut cavity into the blood stream and set up infection anywhere else in the body, including the brain. This is often the mysterious and undiagnosed cause of infections in the teeth and gums, bones, prostate, bladder and sinuses. With the formation of antibodies, the food antigens that leak across the gut wall can sometimes resemble the natural antigens on tissues. Protective antibodies will then attack the antigens, as they should and the tissues, causing further damage. It is the very reason why auto-immune diseases begin. Lupus, multiple sclerosis, rheumatoid arthritis, myocarditis, iritis and thyroiditis are some of the members of this ever-growing category of mysteriously incurable auto-immune diseases.